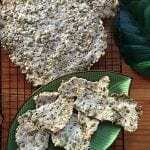 These seed crackers are a great alternative to those artificial, heavily flavoured snacks that we like to enjoy at happy hour without the guilts. They are quick to make and fun to eat, enjoy! 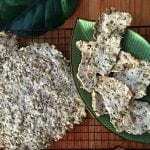 20 gms Almond Meal or substitute for rice flour, buckwheat floor or chickpea flour. Pre heat oven at 180 deg C then turn down to 150 when trays go into the oven. Place all ingredients into a bowl and mix well and allow to sit for 30 minutes. Cut 4 pieces of baking paper the same size as the 2 trays. Place half the mixture on 1 piece of the baking paper on a flat surface. 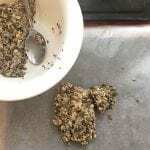 Place a second sheet on top and roll out between the two until the mixture is flat. Or press out gently with your hands until quite thin. 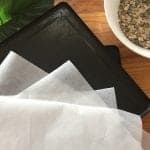 Carefully peel back and remove the top layer of baking paper and slide onto a tray. Repeat with the remaining mixture. Turn oven down to 150 deg C and place trays into the oven and bake for 40 mins. (could be less or more time depending on how thick the mixture is and how hot the oven you have is). Check to see if they look slightly golden and are becoming crisp. Dry on racks and snap apart when cooled. Place in and air-tight container.